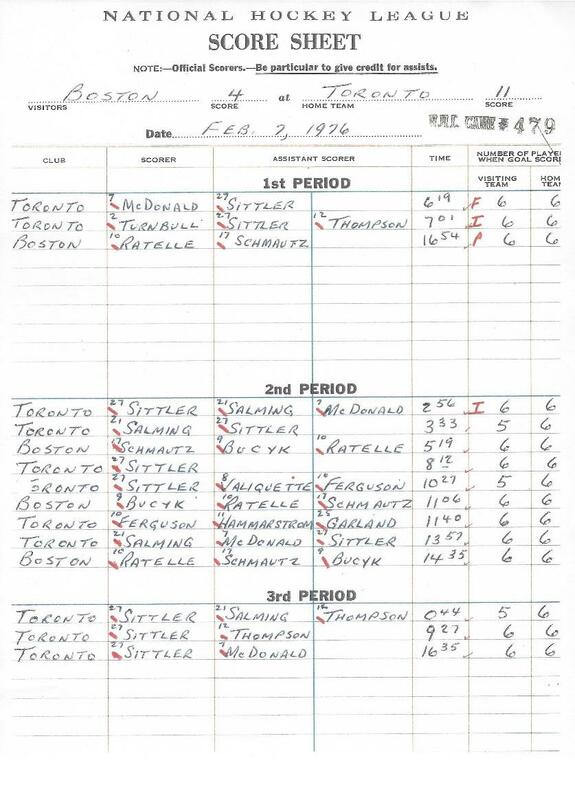 Forty years ago today, Maple Leaf Gardens played host to a truly historic night for hockey. On February 7, 1976, Leafs captain Darryl Sittler entered the Saturday night matchup against the Boston Bruins as the target of owner Harold Ballard’s wrath, having been mired in a scoring slump. Sittler responded with the greatest single-game offensive output ever recorded in the NHL: a ten-point outing in which he collected six goals and four assists. The Leafs routed the Bruins 11-4. All of Toronto’s goals were scored against Boston backup goaltender Dave Reece. Reece was on hand last Thursday at Air Canada Centre as part of a tribute to Sittler to commemorate the 40th anniversary of the milestone night. He and Sittler dropped the puck on a ceremonial faceoff while members of the 1975-76 team were also at centre ice, applauding the moment. A key factor in Sittler’s record-setting night was Boston coach Don Cherry’s decision to forego replacing Reece with future Hall-of-Famer Gerry Cheevers, who had just returned from the WHA, but was under the weather on that fateful February evening. Remarkably, the record has withstood the passage of four decades, including the offensively-dominated era of the 1980’s when the likes of Wayne Gretzky, Mario Lemieux, Peter Stastny, Dale Hawerchuk and Steve Yzerman ran roughshod over opposing goaltenders. No other player has had even nine points in a game. On 13 occasions, a player has collected eight points in a regular season outing. Gretzky and Lemieux each accomplished the feat twice, while Lemieux also had an eight-point playoff game. “To get nine or ten, I don’t know why it happened to me,” Sittler said. “People say ‘is it ever going to be broken?’ I hope not. It could be. The unthinkable sometimes happens in sports.” Indeed, Sam Gagner, then with Edmonton, knocked on the door with a four-goal, four-assist effort on Groundhog Day 2012 against Chicago, the most recent eight-point game to-date. No discredit to Gagner, but he will never be confused for an All-Star. Ten points by one player in one night seems all but impossible in today’s game as teams struggle to find the back of the net. Though if Gagner could come close, who’s to say that any of Sidney Crosby, Alex Ovechkin, Steven Stamkos, or Connor McDavid won’t ever have a magical night such as Sittler’s? 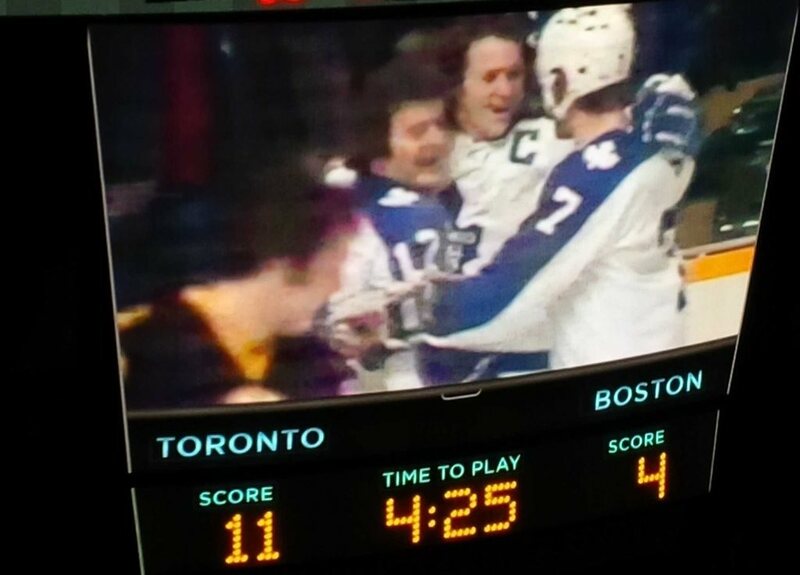 Consider a feat from Sittler’s famous evening that’s just as, if not more, impressive than the ten points. How about hat tricks in consecutive periods? In that 1976 game against Boston, Sittler was ‘held’ to two assists in the first period before writing his way into history, potting hat tricks in each of the second and third frames. A hat trick is rare. Less than ten percent of the time that it occurs is the feat accomplished in one period. To do it twice in one game is unimaginable. Of course, so is chasing the nine or ten-point mark, however in this instance, at least a player has the benefit of the opportunity of collecting first or second assists, as opposed to having to find the back of the net himself. Ten points in a game, and consecutive hat tricks in a game, are two standards of excellence that may very well withstand the test of time. Though if either can be considered tougher to break, it is likely the latter.